This morning, a blogging platform and a microblogging platform have become more symbiotic. WordPress has enabled posting and reading the blogs the platform powers via the Twitter API. This means any Twitter app that supports a custom API URL can be used to either post updates to your WordPress.com blog, or to read updates from blogs you’ve subscribed to. 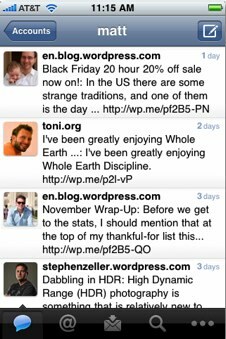 Tweetie 2, an iPhone and desktop Twitter client, will be one of the first third party apps to implement this. As Twitter’s traffic continue to grow, WordPress sees its growth also rising. It makes sense to become more symbiotic with the Twitter ecosystem, considering the rapid growth of the use of third party applications. In fact, WordPress founder Matt Mullenweg told ReadWriteWeb recently that WordPress was trying to develop more ways for Twitter and its platform to overlap. The integration of WordPress functionality with Tweetie is actually pretty cool. All you need to do is add your WordPress account to Tweetie’s settings and you will then be able to post a status update to your WordPress.com blog and also have it displayed in the blog reading view. You can also enable geotagging to show the location of your status update.